THOMAS HUGHES autograph Letter Signed. British (English) novelist. Author of 'Tom Brown's School Days'. ALS. 1p plus integral blank leaf. 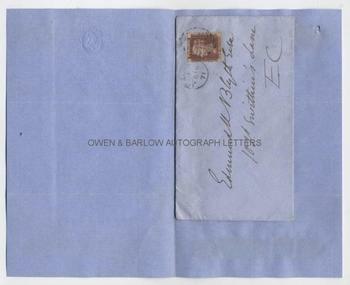 Together with original envelope. The Athaeneum. February 16th, 1871. To Edmund K[ell] Blyth. "Nothing can be clearer or better than the enclosed which I accordingly return without alteration. I hope it may have prompt attention from the De[...?] authorities." [etc]. 8vo. Approx 7 x 4.5 inches. Envelope affixed to the integral blank leaf. 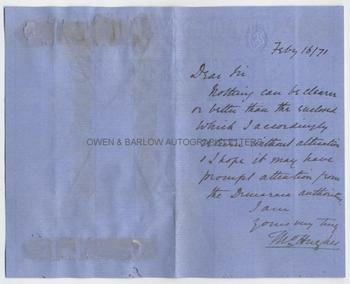 Verso of integral blank leaf has some mounting damage. All else near fine. Best known as being the author of the classic 'Tom Brown's School Days' (1857), Thomas Hughes was also active in the social reform movement. 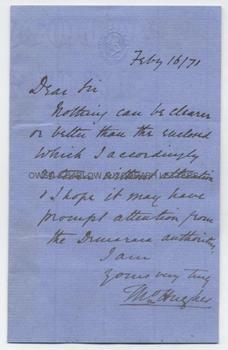 In 1869 he became the first president of the Co-operative Congress and, at the date of this letter, he was involved in the founding of the Working Men's College in Great Ormond Street, of which he became the first principal in 1872. Thomas Hughes was a campaigner against the opium trade and also founded the town of Rugby, Tennessee, as an experiment in utopian living. Edmund Kell Blyth was a London solicitor and author of a biography of Dr William Ellis, the founder of the Birkbeck Schools.